The Dow Theory has always been a very integral part of technical analysis. The Dow Theory was used extensively even before the western world discovered candlesticks. In fact even today Dow Theory concepts are being used. In fact traders blend the best practices from Candlesticks and Dow Theory. The Dow Theory was introduced to the world by Charles H. Dow, who also founded the Dow-Jones financial news service (Wall Street Journal). During his time, he wrote a series of articles starting from 1900s which in the later years was referred to as ‘The Dow Theory’. Much credit goes to William P Hamilton, who compiled these articles with relevant examples over a period of 27 years. Much has changed since the time of Charles Dow, and hence there are supporters and critics of the Dow Theory. Dow Theory suggests the markets are made up of three distinct phases, which are self repeating. These are called the Accumulation phase, the Mark up phase, and the Distribution phase. The Accumulation phase usually occurs right after a steep sell off in the market. The steep sell off in the markets would have frustrated many market participants, losing hope of any sort of uptrend in prices. The stock prices would have plummeted to rock bottom valuations, but the buyers would still be hesitant of buying fearing there could be another sell off. Hence the stock price languishes at low levels. This is when the ‘Smart Money’ enters the market. Smart money is usually the institutional investors who invest from a long term perspective. They invariably seek value investments which is available after a steep sell off. Institutional investors start to acquire shares regularly, in large quantities over an extended period of time. This is what makes up an accumulation phase. This also means that the sellers who are trying to sell during the accumulation phase will easily find buyers, and therefore the prices do not decline further. Hence invariably the accumulation phase marks the bottom of the markets. More often than not, this is how the support levels are created. Accumulation phase can last up to several months. Once the institutional investors (smart money) absorb all the available stocks, short term traders sense the occurrence of a support. This usually coincides with improved business sentiment. These factors tend to take the stock price higher. This is called the mark up phase. During the Mark up phase, the stock price rallies quickly and sharply. The most important feature of the mark up phase is the speed. Because the rally is quick, the public at large is left out of the rally. New investors are mesmerized by the return and everyone from the analysts to the public see higher levels ahead. Finally when the stock price reaches new highs (52 week high, all time high) everyone around would be talking about the stock market. The news reports turn optimistic, business environment suddenly appears vibrant, and everyone one (public) wants to invest in the markets. The public by and large, wants to get involved in the markets as there is a positive sentiment. This is when the distribution phase occurs. The judicious investors (smart investors) who got in early (during the accumulation phase) will start offloading their shares slowly. The public will absorb all the volumes off loaded by the institutional investors (smart money) there by giving them the well needed price support. The distribution phase has similar price properties as that of the accumulation phase. In the distribution phase, whenever the prices attempt to go higher, the smart money off loads their holdings. Over a period of time this action repeats several times and thus the resistance level is created. Finally when the institutional investors (smart money) completely sell off their holdings, there would no further support for prices, and hence what follows after the distribution phase is a complete sell off in the markets, also known as the mark down of prices. The selloff in the market leaves the public in an utter state of frustration. Completing the circle, what follows the selloff phase is a fresh round of accumulation phase, and the whole cycle repeats again. It is believed that that entire cycle from accumulation phase to the selloff spans over a few years. It is important to note that no two market cycles are the same. For example in the Indian context the bull market of 2006 – 07 is way different from the bull market of 2013-14. Sometimes the market moves from the accumulation to the distribution phase over a prolonged multi-year period. On the other hand, the same move from the accumulation to the distribution can happen over a few months. The market participant needs to tune himself to the idea of evaluating markets in the context of different phases, as this sets a stage for developing a view on the market. The support and resistance is also a core concept for the Dow Theory, but because of its importance (in terms of placing targets and stop loss) we have discussed it much earlier a chapter dedicated to it. A double top & double bottom is considered a reversal pattern. A double bottom occurs when the price of a stock hits a particular low price level and rebounds back with a quick recovery. Following the price recovery the stock trades at a higher level (relative to the low price) for at least 2 weeks (well spaced in time). After which the stock attempts to hit back to the low price previously made. If the stock holds up once again and rebounds, then a double bottom is formed. Notice the time interval between the two bottom formations. It is evident that the price level was well spaced in time. Likewise in a double top formation, the stock attempts to hit the same high price twice but eventually sells off. Of course the time gap between the two attempts of crossing the high should at least be 2 weeks. In the chart below (Cairn India Ltd), we can notice the double top at 336 levels. On close observation you will notice the first top was around Rs.336, and the second top was around Rs.332. With some amount of flexibility a small difference such as this should be considered alright. From my own trading experience, I find both double tops and double bottoms very useful while trading. I always look for opportunities where the double formation coincides with a recognizable candlesticks formation. For instance, imagine a situation where in the double top formation, the 2nd top forms a bearish pattern such as shooting star. This means, both from the Dow Theory and candlestick perspective there is consensus to sell; hence the conviction to take the trade is higher. As you may have guessed, a triple formation is similar to a double formation, except that the price level is tested thrice as opposed twice in a double bottom. The interpretation of the triple formation is similar to the double formation. As a rule of thumb the more number of times the price tests, and reacts to a certain price level, the more sacred the price level is considered. Therefore by virtue of this, the triple formation is considered more powerful than the double formation. The following chart shows a triple top formation for DLF Limited. Notice the sharp sell off after testing the price level for the 3rd time, thus completing the triple top. how can we apply dow theory to commodity market in silver to predict the future which is constantly moving down for 4 months?how future market of commodity also affect such situation? TA can be applied on any asset class..as long as it has a time series data. Try and look for retracement on low volumes, double tops, double bottoms etc. Hello sir, this is graph of JP Power.. Can it be said that JP power is in accumulation phase? Volume was relatively less when the stock was falling.. Volumes are remarkably higher since last few months.. Also, there are lower points which the share has not breached.. It does seem to have reversed its downtrend and heading towards accumulation and then uptrend..
Not really Ganesh. In a typical accumulation phase the stock gyrates in withing a 20 – 30 % range, but I can see JP Associates moving from Rs.20 (or sometime near Rs.30) all the way down to Rs.10..which is more than 100%. For this reason I would not really call it an accumulation phase. Sorry, need a bit more clarity on your question Narsimha. double bottom bulish & double bottom top indicators. Essential condition for Double Bottom Reversal Chart Pattern is that the stock must be in continuous down trend before forming the pattern. Moreover Volumes play a very important role in the success of the pattern. If the stock breaches the bottoms formed it will sureshot head lower and lower forming lower highs and lower lows and thus continuing the downtrend. hmm…..i’m enjoying sir….thank you sir….
. repated double/triple bottom/top can indicate ‘sideways’ direction of market too.. right? can we use B-Bands to confirm this?
. in light of A-D phases , please help about “AD” and “ADX” indicator . i read about it but i m still feeling clueless. A-D is for accumulation and distribution phase ..usually this is when the markets are in a range. Will probably include a write-up on ADX soon. Also as you said repeated movement between two bands can indicated sideways movement. In fact BB is a great indicator to trade the sideways market. If a nice looking Double Top formed in the weekly chart , may I take that as a long term down trend? Double Top is conducive for a short trade and not really a long trade, unless you are expecting a breakout. the near term/short term trend is DOWN. Will that be a correct statement? Yup – Primary trend is the generic multi month trend, secondary is the multi weak trend, and short term would be over the last 1 week or so. This is a Triple Bottom, so we can be bullish. But this is also a Descending Triangle which means a potentially bearish signal. So how should we Read This ? Guess you can initiate for quick long trade…but looks like the stock may correct a bit. I have a doubt in the tenet 7. Even if the prices falls the volume is going to increase. How will it decrease tha volume if prices falls? Well, the fall in prices can be backed by low volumes, no harm in that. It just indicates lack in participation, and maybe some weak hands placing trade. In fact its best if you compare toay’s volumes on a end of day basis by looking at last 10 day simple average. how we know foreign investors are in and out of our market? You can track the daily data put out by NSE/SEBI. Suggest you check their website. Can i use double/triple bottom/top system on intraday trading ? when we are going to long or short how to find well defined prior trend? any minimum days? No prefixed rules here, depends purely on the strategy. How can we find whether it is The primary and the secondary trend.? Casual look at the charts will reveal this. the people who stay even they make loss will get success. now I am correcting my mistakes. it is really difficult to stay long in Trading for newbie . Really hats off you sir, you have very good knowledge I have seen many traders but no one taught us like you. Suresh, I’ve been trading for over 14 years now. My initial days were just like many newbie traders (losing money, getting demotivated). I’ve made several mistakes while trading, because of which I learnt. ..but later on things improved. All I can say is stay put, stay focused, keep learning, and I’m sure you would be a much better trader going forward. While initiating trade for long or short after recognizable candlestick pattern formed prior trend should be down and up respectively, but how many trading session prior trend should be for strong trend? 1 week, 2 week or more? At least last 5-6 trading sessions or price change of at least 5%. how can we find these are institutional or retailer traders? There is no way you can determine this. General assumption is that if volumes are good, then its the smart money trading. For plotting Fibonacci Retracement in chart first we should find trough and peak, there are many small peaks, is it any minimum number of days or % of price moved from trough to peak to identify ? I usually look for 10% or more. I have one doubt if the INDIA VIX is below 18 the movement in Nifty option is low and above 20 the movement is high, Is it right or wrong? Yes, I’d suggest you go through Option Greeks module for a better understanding of this! I know there is some confusion wrt to MACD, I do plan to re write this as soon as possible. You have mentioned that before double bottom/top formation the stock should trade at higher/lower levels for at least two weeks. Are you advising this for swing trading? If iam considering the pattern for intra-day what is the time frame for better result? Playing the double top/bottom is a bit tricky, you would need to look at points where the price coincides with the band’s top or bottom. For example if the price is at the bottom level, you need to look at buying the stock/index with an expectation that the stock will bounce back into the range. Likewise if the stock is at the top of the bank you could look at shoring opportunities within the day with an expectation that the stock will fall back to the range. A combination of price action + basic indicators will help you get started and achieve results. Hi Sir, Thanks for a great article. My query is: Can we say Head and shoulder pattern also as a DOW pattern? also request you to please clarify if Pidilite Industries has formed a bullish head and shoulder pattern on daily charts and has given a break out on 25th Jan 2017. Thank you. Yes, in fact H&S is considered as a Dow patter. Pidilite seems bullish, but I’m not sure of its a H&S pattern. If there is bearish candle with huge volume, obviously the volume candle is also red.can we consider the high volume bearish candle for the trading plan? sir for intraday trading which trend we should follow primary,secondary OR minor? Secondary trend. But do keep an eye out for reversals. It means there is no smart capital investing in the stock, a good case for a sell off. I am confused between primary and secondary trend, can you explain little more what does it actually mean? Primary trend is the longer term trend which can occur over many months of even few years. Secondary trend is a short term trend, which is counter to the primary trend. How to scan stocks out of a large list (400 stocks) daily that are breaking out from a previous support or resistance level? how can i perform such a screening on a daily basis? how do I identify stocks that are likely to have a greater volatility and continued price growth or decline (around 15% to 20%) over a 10-20 day time period? Usually the problem that I face is as soon as I zero in on a stock and enter into a trade, the price moves very slowly and sometimes remains in a sideways trend. This happens in case of good liquid stocks also. Hence is there any way through which I can be a little more confident that upon entering into the trade the stock price will move decently (up or down)? No, its really hard to predict the future volatility, unless there is an event around the corner, in which case the volatility invariable shoots up. Could you plot the Primary and secondary market trend for any stock taking as example ? Will try and put up the graph sometime soon. But this one is fairly simple, the long term trend is primary and the shorter term trend (over the last few months) is secondary. How can I ensure that I am not placing my order near the end of an ongoing trend (short term, intermediate or primary trend)? Because momentum indicators tend to remain overbought/oversold for quite long in some cases? primary trend is long uptrend or long downtrend which exist for around a year. secondary trend is small correction to the primary trend whenever we find sudden upmove/downmove in primary trend. but I confused what is minor trend ? are we finding in accumulation phase.? Yes, your understanding is correct. People consider the minor trend as the day to day fluctuation in prices, usually keeping not more than a week in perspective. Is there any prior trend condition for double bottom and top formation ? No, not really. The condition is applicable for all candlestick patterns though. 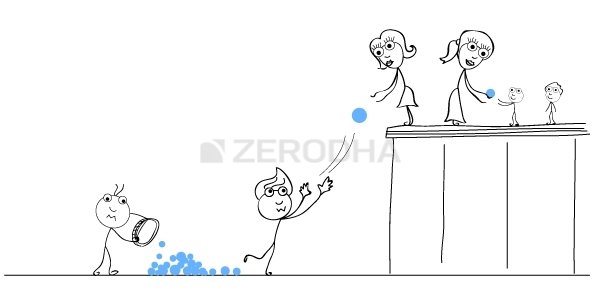 Keep a track on this module – https://zerodha.com/varsity/module/trading-psychology-and-risk-management/ will be updating a very important chapter today. sir, if these double/tripe top/bottom formations occur in intraday then will they hold the same significance? Yes, TA is applicable across any timeframe. 1. In the DLF Chart that you show, after the 3 top formation, there are 4th and 5th higher tops, so in this case, what should make the trader be sure about his prediction, shouldn’t the trader be worried and exit the trade? 2. Also are there stop losses employed for these theory? If yes, the stop loss would have triggered in DLF case isn’t it? Thanks for all the knowledge you share with us from zeroda platform. Sir I want to know how to calculate that stock is undervalued or overvalued ?? 1) In which phase of the market(accumulation,mark up,distribution,mark down) does the primary,secondary and minor trend occur?Do the primary,secondary and minor trends occur during the markup and markdown phase alone or even in accumulation and distribution phase also they occur?To my understanding on reading this chapter accumulation and distribution are sideways market and in mark up and mark down phase alone the three trend would occur,am i right? 2) Sir suppose if we are a risk averse trader and we are planning to enter a trade on P2 day, but suppose if the target what we have planned is reached before 3.20 PM of P2 day and the candle start to retrace and from a very small wick around 3.20 pm and is trading slightly below (less than 1%) our target and close the day, then still can we enter that trade for the same target (T1) or can we hope that it will reach the new target(T2)?or should we avoid the trade? 2) This can be a little tricky, but you can setup a trade with a very strict stoploss. 1) If in a double/triple top/bottom patterns are reversal patterns,then does it mean that there must be a prior trend to reverse.I read so in stockcharts,is that true? 2)If the peak in between double top/bottom is around 30% is that considered a double top/bottom patter?or in what percentage the peak in between can be formed? 3) if the double top/bottom is formed and if we enter the trade, what should be the target?if there is any other resistance in between the middle peak and the pattern top/bottom, that should be considered? or should we consider the in between peak as the target or can we hope or the breakout to happen and wait for that too? 3) The tops and bottoms form a range. If you enter at the double bottom, then the target could be the high of the range, likewise for shorts. If you think the range will break, then you can trail it as well. Are you familiar with volume study? Take a look at this – https://zerodha.com/varsity/chapter/volumes/. I plan to cover market profile sometime soon. Thanks. Yes, will put up notes on this sometime soon. In fact, double top/bottom formations happen because of the support and resistance points. So they are interrelated. Did companies know who are big players(smart money) buying/selling their stocks? Dear Karthikh sir…I’m very inspired with this all knowledge through varsity. It’s very useful for traders and investers. I think you should explain some more straitagies specially for intraday trading. It will be useful for retail intraday traders latestly joining Zerodha. Small correction in my name…Solaskar. Happy to note that, Rajesh. In fact, the current ongoing module is dedicated to Trading Systems – https://zerodha.com/varsity/module/trading-systems/ . Request you to keep track of this module. Its certainly not a double top, Rinkesh. At the most a double/triple bottom at around 27. Sir, the look back period was 2 years and it appeared to be a double top. The question is that the duration of this pattern should be short? Also, I read on various websites that the pattern like double bottom is completed when it passes the peak of trough with higher volumes. But it still appears a double top to me because the stock was in an uptrend till the peak around Rs 34.50 during June,2017 and the trough in between was Rs 26.25 during November, 2017. Again, the stock recovered to hit the peak of exactly Rs 34.50 during the start of 2018 and then it has started slipping downwards. It also appears a head & shoulder pattern to me. I am waiting eagerly on this. The thumb rule is that the volumes should be higher when the breakthrough move happens. So if you are looking at a double bottom, then the price when it moves through the trough to peak (especially at the time of crossing the peak), should be on higher volumes. Do you think Moving Averages can be used to identify the primary and secondary trends. Like use a long period EMA for seeing the primary trend and use a short term EMA for secondary trend? Yup, as long as you use long-term moving averages, like 50, 100, or 200-day moving averages. Hi, the mark-up, accumulation and distributions phases can be classified as primary trends or secondary trends?? These can be phases within a large primary trend. How to find the S&R levels for a stock whose price is ever increasing(eg: Ashokley)? That is not really possible as there are no previous reference points. Is smart money invested only in equity shares or they invest in Futures also ? and sir one more question.. When I buy a future lot of any stock, does the company blocks a number of shares for me ? Both Eq & FO Priyesh. No they dont. Sorry i didnt read further and just asked the question. Trend is the general direction in which the stock or index is moving. If the stock makes higher high on a daily basis, then the trend is said to to up. Likewise if the stock is making lower lows, then the trend is said be down. The trend also has strength associated to it. A trend which is strong can last long. Not all trends can be strong. When the institutional investors (smart money) absorb all the available stocks why do the short term traders sense the occurrence of a support? Think about it, when all the stocks are absorbed, it also implies that the stock does not make lows. So the support does occur. For the purpose of this query, let’s take an example of the double top pattern. Since the tops in this pattern would also form resistance levels, how to differentiate between an actual pattern and stock just testing a resistance level. Meaning that, while forming double tops or testing resistance also the spacing should be 2 weeks. So if a particular price point(resistance) is tested twice, but the spacing is well more than 2 weeks, then is it a Dow Pattern, or just stock testing a resistance level. In fact, the double/triple top is formed by testing the resistance. These two occurrences cannot be isolated. This would be a dow pattern. 1. I have another query about the timeframe of charts. So if someone is looking to invest from a year to 2 year basis then the double top formation, separated by 8-9 months or a year should still work for them, right? And if a trader wants to take a trade based on some days’ timeframe then the double(or triple) top formation separated by more than 2 weeks should work. 2. I think, that a triple bottom is formed in IDEA, in the attached chart. Could you please take a look? 2) Yup valid triple bottom this one. How are the triple top and bottom formations any different from S&R. In the S&R chapter, you mentioned that we need to look for atleast 3 points, well-spaced in time, around the same price level. Isn’t this the same? Thank you for doing this btw. I have been going through the modules at record speed! It is not different, Aviral. Both double and triple bottoms are manifestations of the support and resistance levels. They cannot be looked at isolation. Remember, end of it, it is all related to the price action. Thanks Karthik for your help through varsity. What would you do if there is a double top formation well spaced in time, but not coinciding with recognised candle stick pattern ? Well, I’d evaluate other parameters and take a call on a case by case basis. Remember, nothing is written in stone, end of the day it is about price action and your understanding of markets. CS pattern rule help in increasing the odds. Can DCF be used for analysing NAV of Mutual funds? Is there any suggestion Sir to analyse Mutual Funds?? I guess its best to keep MF analysis simple. I’d suggest you look for the fund house, fund manager’s track record, assets under management, and how long they have been in the business. Sir how to use market profile is there any tool for it?and how to get it if it’s there in zerodha. Unfortunately, this is not available on Kite. I went through standard deviation it shows the range but ……How analyst suggest targets? Is there any statistical or technical analysis behind it? Most of them look at technical analysis based targets, Satish. Sir in double top double bottom formation on which day should we initiate a trade is it on p1 or p2.And if there is no recognizable pattern can we trade if the particular price point has tested and sustained. That would be on P2. Yes, you can trade. Remember, double top/bottom etc are all Dow patterns and not really CS patterns. Sir is v-shaped and double bottom are the same? Nope, both are reversal patterns, but yet they are different. Its hard to predict and time the reversal in V shape, but in the double bottom, its possible. Hey karthik. What if i take a trade based on the double bottom pattern and buy the stock as soon as the double bottom pattern is formed. But it can also form a triple bottom pattern after my buy. So i this case i will lose my money if i buy after the double bottom pattern( in case it forms a triple bottom pattern). So whats the reliability of this pattern. On what basis should i take the trade??? Hence, I always prefer to take an option position when I spot such opportunities based on Dow Theory! First of all thanks a ton for making aware so many people of valuable techniques. I’ve not checked investing.com, maybe you should check their support articles. CS patterns only increases the probabilities of a trade, but does not really guarantee the outcome. So you will have to use it accordingly. I must appreciate the Zerodha team and especially Karthik Rangappa for the effort to put together most of the educational information available, related to financial markets on this platform. 10 years back when I started my research work on financial markets, no such platform was available in India. But the availability of such platform now; can really fasten the learning process and help most people who look at financial markets as business and not gambling to make money consistently. Hats off to the team for the effort. Would look forward to meet the team in future. Dr.Anand, thank you so much for the kind words and letting us know your thoughts. We will continue to work towards adding more content. Thanks. i just want to confirm , is it a triple top formation on daily charts of voltas? is it a sell signal? Yes, it seems like it.